A tunnel through the range just to the west of The Gap for both the Stuart Highway and the railway is clearly the most practical engineering solution to both the flood threat and looming traffic traffic congestion. But the chances of that are slim because sacred site custodians are likely to say no, says town council election candidate Glen Auricht (pictured). For the fluent Aranda speaker, who has spent most of his working life in close contact with elders at Hermannsburg, sacred sites are no mere irritation. They are a matter of life and death: When in an act of horrendous vandalism the tail of the Yeperenye caterpillar was bulldozed to build Barrett Drive, he says people were harmed because they had not managed to protect a key totem. A song line spanning the country had been mutilated. Significantly, removing the road and rail passage through The Gap would allow a much bigger flow of the river to pass through, perhaps 30% bigger. It seems an attractive alternative to a “fly-over” being considered now, a grotesque defacing of the town’s greatest landmark. But it may take 100 years, says Mr Auricht. He says traditionally women were not allowed to pass through The Gap “but elders opened it up 100 years ago”. 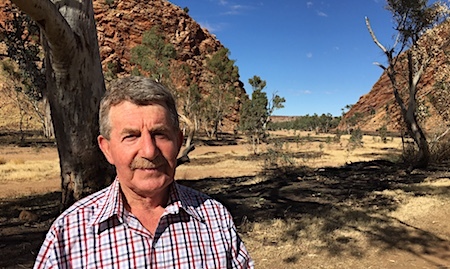 He was working as a building manager from 1973 at Hermannsburg with the Finke River Mission and later running the Tjuwanpa Outstation Resource Centre there. 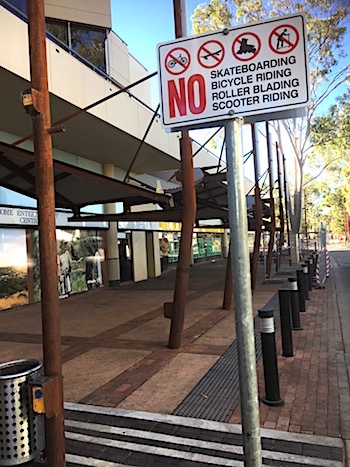 In the last 21 years he has been based in town as a civil construction project planner, with the NT Government’s variously named department colloquially known as Works and Jerks. He retired on Show weekend this year, is setting up a consultancy firm, and wants to bring to the town council his civil engineering expertise as well as his intimate knowledge of social issues gained from Aboriginal people. On that score he is clearly putting his trust in senior elders while taking an unblinkered view of the “young hooligans” who, neglected by their parents, have governments stumped about what to do. These “young criminals smash and burn” and are “stretching everyone’s patience”. He says he is aware of 20 to 30 Alice Springs families who’ve taken their kids “out of the system” here, moving to Murray Bridge, Adelaide and Mt Barker in SA, some with a dozen or more kids in their households. Regrettably, when these kids come back to Alice Springs, some are branded by their peers as “too much white feller”. He says as a councillor he would have good use for his professional skills acquired over decades, both with the Finke River Mission and the NT Government, dealing with kinship and land ownership issues, sacred sites, getting major and small projects off the ground, obtaining sacred sites clearance, negotiating with the Central Land Council, estimating, scoping of work, locating resources, and talking with stakeholders. He also has under his belt a university qualification in civil construction and civil project planning. Should the landfill be moved from its present location? This is becoming a pressing issue: The transfer station and the tip shop would need to stay for public convenience, but moving the dump out of town or expanding it into the Desert Park will need to be decided. If relocated the need to protect the town’s water table is a major consideration, says Mr Auricht. Should we recycle the town’s sewerage now being treated in the sprawling evaporation system, taking up much of the picturesque Ilparpa Valley? This needs to be considered, given our “finite water supply,” says Mr Auricht. At least waste water should be used for parks and playground irrigation and dust control, provided harmful contaminants are removed. He says the council, in the five and a half year term ending now, has good runs on the board: Economically living within its means, maintaining sports facilities second to none, sponsoring cultural events, litter collection, looking after trees and verges. The council’s recycling facility and waste management are a “great thing” but people still dump in the bush because they want to avoid paying fees. Mr Auricht praises the highlighting of sacred sites and signage at foot and cycle paths “to educate people in the significance of places”. • Bring alcohol abuse under control and promote a “good town atmosphere”. • Drive law and order by working with the police and Aboriginal organisations, supporting them in managing their own problems. Take on delinquents and make them change their behaviour. “At the root of the problem are dysfunctional families, who are violent, drug addicted, have no respect, no love, just anger and frustration,” he says. “There is as yet no clear strategy. Everything’s been tried. Locking up and throwing the key away seems to be not regarded as an option. “Young people abuse elders, don’t give two farthings for traditional knowledge, run amok. “For them eduction has no point because they see no job prospects. We need to put a future in front of them. We need to make education relevant. “New ideas have to be brought to the table. Maybe social media messages can dissuade young hooligans. The Council has a role, but just as one of 20 or 30 organisations and departments. Mr Auricht says although many of the town’s problems are outside the council’s legislative powers, it needs to make sure it has a seat at the table. It can exert significant lobbying influence. Apart from his solid work record, his community work CV would be the envy of most candidates: Long-time volunteering for St John since 1969 in SA, Finke as a volunteer for 25 years, BMX, cricket, AFL and first-aid support at countless sporting functions. And he raced on a bike in the Finke 12 times, until 2002, only this year exceeded by his son, Caleb, for whom this year’s was his 13th. Known him for the past 37 years. Has an intricate knowledge of all aspects of Centralian life. Involved in a range of community activities. Just the person for council. Never met the man, but his credentials sound good. Best of luck!